(TibetanReview.net, Jan18, 2015) – After being in force for nearly seven years, China has finally lifted a ban on the issuance of passports to the lay Tibetan public in Serta (Chinese: Seda) County of Karze (Ganzi) Prefecture, Sichuan Province, while continuing the restriction on the local Tibetan monastic population, reported Radio Free Asia (RFA, Washington) Jan 16. 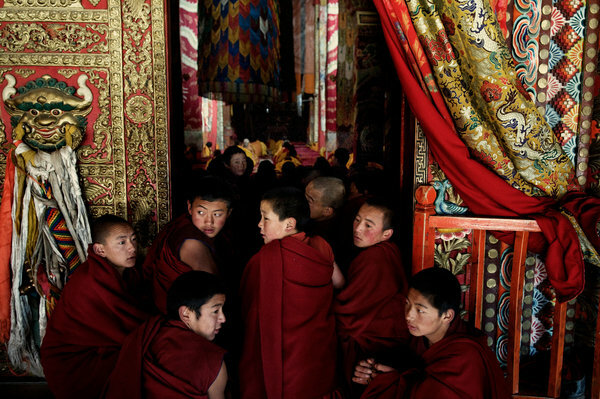 The report added that officials contacted by phone had refused to explain the continuance of the passport denial to the Tibetan monks and nuns. The ban was imposed in 2008 when most of the Tibetan Plateau was hit by an upsurge of Tibetan protests against Chinese rule. Monks and nuns had played a leading role and suffered many casualties during the protests and China’s ensuing brutal armed crackdown. The report said lay Tibetans began to be issued the passport about a month ago. However, former monks are required to submit a written assurance, denying having any connection with any monastery. The passports are being issued only to actual travellers, and have to be returned to the government at the end of one’s trip. A passport fee of 3,600 yuan (US$ 580) has to be paid to a travel agent against whose receipt the office of overseas travel in the prefectural seat of Dartsedo (Kangding) grants the approval. However, in case the approval is not given, the travel agent returns only 2,600 yuan to the failed applicant, the report added.